﻿I love this craft for giving this holiday season. It's cheap, easy and as fun to give as it is to recieve! Remove Kool-Aid package. Mix 1 cup water and 1 Tbsp. oil in a large microwave-safe bowl. Add remaining ingredients in the jar. Stir until well-blended. Microwave on high for 3 to 4 minutes, stopping every 30 seconds to stir. Let cool, and enjoy playing! 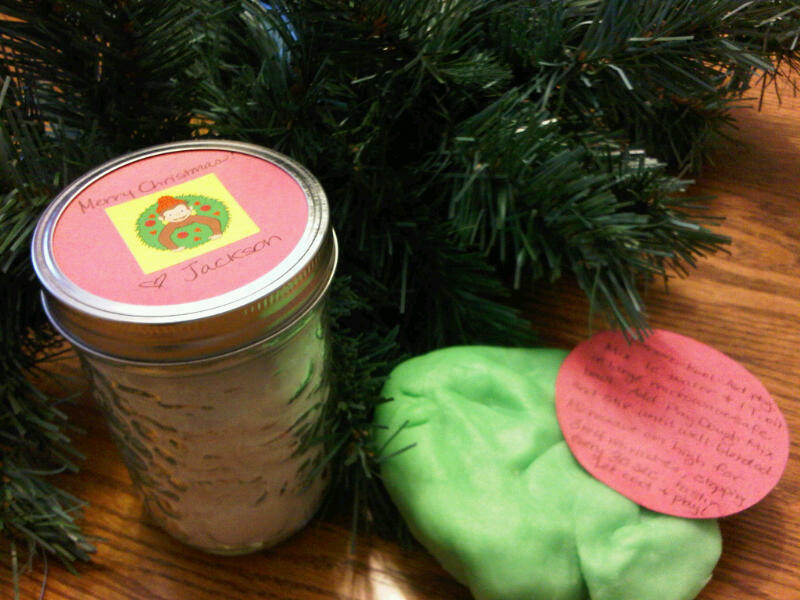 Decorate the jar as you wish using cloth, paints, stickers or ribbon. My son and I kept it simple by tracing the inside of the canning lid onto construction paper. We worked together to cut out the circle, add stickers and include the assembly directions on the back. The construction paper circle is then placed between the two pieces of the lid. Not only does this craft allow quality time for my son and I as we create it for friends, but it also gives the gift of together-time to another family as the play dough is mixed up by friends and their parents. Love it!